Mugs for newcomers Their Majesties gifted to all newcomers mugs made by Master Tiberius. Tatiana Hopfen AoA Scroll given out to her as a backlog from 2018. It is not often that a new Barony is made, however, on this day, the 15th day in the month of December, Anno Societatis 53, called in the Common Era 2018, the East Kingdom would do exactly that. For the first time in five years, since the making of the Barony of Endewearde, there would be a brand new Barony. When Their Majesties arrived, the hustle and bustle of preparing was well under way, and it wasn’t long until Their morning court was opened. There was but one piece of business for this morning – the investiture of the very first Baron and Baroness of Buckland Cross. The herald then welcomed Aurddeilen-ap-Robet and Sigridh Bengstdotter to present themselves before Their Majesties. Winter had come early, leaving snow upon the ground in the Shire of Rusted Woodlands. But the 17th of November, AS 53, called in the common era 2018 was a touch warmer, and as the snow turned much of the earth to mud, Their Majesties Wilhelm and Vienna did arrive at the 30th Anniversary of The 100 Minutes War. Before the warriors gathered there took up arms that day, Their Majesties held a court at the edge of the field. Sir Tanaka spoke to all about the plans for the day, and welcomed all to enjoy. Then first called before The King and Queen was Andromedas of Surtr’s Brood, and as he knelt in the mud before Them, Their order of the Silver Tyger was called as well, and while the scroll had not arrived in time, Their Majesties Herald spoke words to commemorate his addition to the order, and a medallion was given. The scroll made by Melina al Andalusiyya, Robin Dit Dessaint and Dankwert Bathory was promised to come. While the order was present, Their Majesties called another to be added to their ranks. 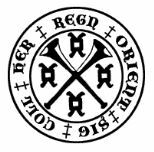 Halfdan the Grimm was the one to hear his name and with a wooden rune tablet by Mariette de Bretagne and a medallion as well, he was made a companion of the Silver Tyger. Next to hear his name cried out was Fearghus O’Conchobhair. His Majesty spoke about this fighter and then called forward the order of the Tygers Combattant. With a legacy medallion from Count Ivan, and a second medallion made for Fearghus by his own deputy, as well as an incredibly tiny and intricate scroll by Palotzi Marti, it was done. Their Majesties had one more piece of business for this muddy morning. They bade their herald call before Them Ioannes Aurelius Serpentius. They spoke about his skill with the rapier, and They called before Them the order of the Silver Rapier, so that this man could be included in their numbers. There was a medallion made for him by Anne de Basillon and an Icon tablet made by Anna Dokeianina Syrakousina, that came with very specific instructions not to lick it. Her Majesty announced that She had favors for Fighters and Fencers and with that Their court was suspended until that evening. After a day spent fighting, fencing, throwing weapons, shooting arrows and talking with friends, the time for Their Majesties to reconvene Their court had arrived. Their Majesties Wilhelm and Vienna processed into the hall, followed by Crown Prince Ozurr and then They welcomed Prince Edmund of the Middle Kingdom to join them. Royals greeted one another and gifts were exchanged between the kingdoms. At this point, as the writer of these recollections, I must ask for some understanding – The hall was dark and my eyes are not as young as they once were. I endeavored to keep good notes of all that occurred, but I am not certain I can read all that I wrote. Be that as it may, we shall continue on as best we can. Sir Tanaka was called forward to share information on all the work that had gone into making the day possible and to offer thanks all those involved in making it possible. Then he had the various champions of the day announced. First was Morwill McShane who had won the Fencing competition. Next was the results from the Heavy Weapons activities, where Captain Sirus (of the Middle Kingdom) had captained the force that came in first, and Klaus Von Vallachia had captained the other force. While Archery had seen only 2 participants this day, Thrown Weapons had a champion, one Thorormr Barnakarl. Her Majesty next recognized two additional members of Her guard. Antonio Giancarlo Nicastri and Jibril ibn Ammar al-Fayyad were called forward and put to work immediately. The herald now called Aisha Bint Allan into Their Majesty’s presence. For all of her work the last 4 years at the Pennsic Wars caring for fighters as well as her work with the Watch and her help with State Dinner, an Award of Arms was hers this day, commemorated with a scroll made by Dag/Dane Geirvardr. Gauthrum of Drachenklaue now heard his name. As he knelt before The King and Queen, They spoke of his time spent as a Heavy Weapons fighter and about how others found him helpful and worthy of being a Lord of Their court. And with a scroll by Triona MacCasky and Toki Skaldagorvir, They made it so. The next gentle called was not present in court, and however Baroness Lada Monguligin promised to carry the Silver Brooch medallion and scroll by Katherine Barr to the gentle Their Majesties had decreed a companion of the order this day. There was another that Their Majesties wished to add to the order of the Silver Brooch. They had called for him at St. Eligis the week prior, and he had not been present. Today when they called his name, again he did not come forward. However, Duke Brennan claimed to be kin to this gentle, and offered to carry the medallion and the scroll by Caera Fitzpatrick to him. Newcomers were called forward and given tokens from Their Majesties, as well as encouraged to return soon to another event. Now Their Majesties called three gentles forward all together. Maeve Draco, Hunter Odhinn and Bigbee Sherwood, for they were a family. Her Majesty stood and drew one called Mourn forward as well. She spoke about how blessed She had felt when asked to attend the Handfasting of Mourn and Maeve the Pennsic prior, and about all they had had to overcome and about how they deserved great happiness. Their Majesties wanted to make these three gentles lords and ladies of Their court. With a scroll for Maeve by Eadaoin Chruitire, a scroll for Hunter by Eowyn Eilonwy of Alewife Brook and with a scroll for Bigbee by Emeline la Chauciere it was so. The next name called was Ludovic of Carolingia, who had formerly been called Loki. The order of the Silver Tyger required the addition of this fighter, and with a medallion as well as a scroll by Triona MacCasky and Kayleigh McWhyte – he was made a companion. But there was another who must be added to this order. Their Majesties called Josef von Ulm, and spoke of his worthiness to be a Silver Tyger, and with medallion and a stunning scroll by Katherine Stanhope, he was added to their ranks as well. The gentle called Elena Lencioni was next urged before Their Majesties. Much of her service was discussed, and the order of the Silver Wheel was called to surround her, as The King and Queen added her to their numbers. A medallion and a scroll by Ommadan inigena Ru commemorated the event. Her Majesty then stood and called the children present forward to join her. She spoke of the fact that many kingdoms, not just The East, had traditions regarding toy boxes for their children. She then gifted Prince Edmund with a large carton full of tiny dragons for the children of the Midrealm to enjoy. His Highness hesitated for a moment – concerned that he might be expected to run from the Eastern children with this box of wee dragons. Her Majesty quickly assured him that while the children of the East demanded sacrifice, it would not be him. The King called forward Dietrich of Timis, and handed him the toy box – there was then counting, not entirely all the way to 3 as I recall, and off they all went – straight down the center aisle of the hall, where Dietrich hesitated, knowing how much mud he faced through those doors, and with that thought, he was lost to the glee of the children of the East. Duke Balfar now begged a moment of Their Majesties time. He had in his possession, a squire’s chain that a member of his house had found in a mud puddle earlier. It was determined that this squire’s chain belonged to Muiredach Ua Dálaig, squire to Sir Harald Hokonson. With a bit of encouragement, it was determined that there would likely be a quest. Which lead to Duke Andreas der Eisfalke telling a tale of an incident from his and Harald’s early years that involved dancing and the loss of a squire’s chain as well. Their Majesties then bade Their herald to call the next name. Donnchadh mac Eoin was the name the herald cried, and as he made his way forward to kneel before the King and Queen, it was clear he wasn’t certain why he had been called. Their Majesties had heard tell of his interest in Commedia Dell’arte and his dedication to becoming a great scribe for the Eastern Kingdom. They knew he should be a Lord of Their court, and today They would make it so. This award of arms was marked with a scroll made just for Donnchadh by Wulfgar Silfraharr and Theodora Bryennissa, called Treannah. Now Their Majesties demanded that the very same Wulfgar Silfraharr come before Them. His Majesty had seen this man upon the rapier field, and He knew his dedication to the forms and practice, and They knew that it was time that he be added to Their order of the Silver Rapier. The order was now called forward that Wulfgar should stand among them as he was added to their ranks. There was not one, but two medallions, one made by Anne de Basillon just for him and one passed to him from the Baron of Settmour Swamp, Sir Jonathan Miles. Finally there was a scroll made for him by his teacher and mentor, Orlando Sforza. His Majesty took the opportunity now to speak about how this past summer at Pennsic He had noticed that only the Heavy Weapons champions team had surcoats. He talked about how much this bothered Him, about how the Fencing, Archery, Thrown Weapons and Arts and Science champions deserved to wear with pride regalia than was just as special. Because of this, Their Majesties had had Champion regalia designed by Anne de Basillon, for Fencing, Archery, Thrown Weapons and Arts and Science. Prototypes were shown and the response was a roar of approval and a standing ovation. Once the populous had settled back down, Her Majesty had Harolt, called Harold of Bloodguard called forward. She told a story about a gentle who spent 3 days caring for others who had been struck ill, before he even put his own tent up at Pennsic many years before. She spoke of the care this man always took of others, and about how he had done so, quietly, without an expectation of recognition for many years. She asked if he would consider wearing Her glove, that all would know him as the example of courtesy that he is. With a nod and strong emotions crossing his face, Harold was made a companion of the Queen’s Order of Courtesy. His Majesty then spoke to this man. About how there was something else They wished to do, about how from the very day that He had won Crown Tournament, They had known They would do this – that They would make him a Baron of Their court with a Grant of Arms. His Majesty then called Duke Andreas forward again – he brought with him a coronet made just for Harold and then returned yet again, with a helmet fashioned with a field coronet upon it, that all will know both in court and on the field that this man is a Baron. The scroll to mark this event was made for him by Kayleigh McWhyte with words written by the King himself. Now the herald called for a gentle who was not present in court. However Baroness Lada Monguligin had known this gentle would not be present for this moment, and she came forward in their stead. Their Majesties called for Their order of the Silver Crescent and spoke about all the work this person does as a marshal, on kitchen staff and as an exchequer. They expressed Their desire to add this name to the ranks of the Silver Crescent this day, and Baroness Lada promised to ensure Their words were carried to the recipient along with the medallion and the scroll made by Eleanore McCarthaigh and Alexsei Dimitriev. Their Majesties then had Sir Mohammad, Sir Angus, Sir Pellandres and Sir Baptiste all called before Them. His Majesty spoke about how these men had a household that stood above so many others, about how they could be seen sweeping across the battlefield in their orange and black, representing much of what the East Kingdom strives for. This is the House Al-Karakal, and Their Majesties saw fit to award to them the Blue Tyger Legion and gift them a silk pennant that Her Majesty had made for them to mark them such. As these 4 men began to head back to their seats in court, Their Majesties commanded that Mohammad Sevim Oglu Gowan Oglu, remain before them. The King spoke to him now about how he was a generous man who dedicates much of his time to guiding others as they begin to find their way in the SCA, and about how He had always aspired to be like Sir Mohammad. Then He had the herald call forth all the Tygers of the East present, and announced to all assembled “A Tyger stands before you!” As Sir Mohammad’s household brought forth an official kaftan of the house, with Tiraz bands embroidered in gold. A scroll done all in gold leaf by Honig von Sommerfeldt, Onora inghean Ui Ruairc and Nataliia Anastasiia Evgenova was read. Their Majesties asked if either of their Highnesses present wanted to say anything to those assembled. His Highness of the Middle mentioned how very happy he was that he keeps coming to this event, and His Highness East thanked all who had helped make this day so memorable. With that, all Their Majesties business was concluded and the day was done. The day dawned dark and stormy in the northern region of the East Kingdom, with rain pouring down from the heavens above at a steady pace. This is how it all began on that 3rd day of November, Anno Societatis LIII, in the common era of 2018. The tournament to choose the Kingdom’s heirs must take place this day, regardless the weather. The combatants and their consorts had begun to arrive, the event staff making adjustments and finishing preparations, and then King Wilhelm and Queen Vienna did arrive. Their Majesties gathered all those in attendance close in the giant barn that would protect the competitors from the elements. First the rules of the list were read out, The King and Queen then had Their herald call forward Master Steffen of Silverforge. Master Steffen read an important Inclusion Statement that had been signed by a great many Peers of the Kingdom. It was noted that the statement and the signatures could be found on the East Kingdom Wiki. (https://wiki.eastkingdom.org/index.php?title=East_Kingdom_Peers_Inclusion_Statement). The King then spoke about how important it was that honor shine this day. His passion for clean, clear wins and fights filled with honor was so strongly evident in His every word. Then Master Rowen Cloteworthy’s voice rang out with the names of each combatant and their chosen consort. One by one these hopeful couples stood before their King and Queen – a rose from Her Majesty for the consort, and a few words from the King to encourage the combatant. The last pair welcomed, The King and Queen bid one Goerijs Goriszoon to raise his voice in song, yet another bard who borrows from The King’s most favored bard called ABBA. And thus the tournament began. Round after round was fought. Noble deeds, chivalric acts, kindness and ferocity all filled the space. At the end of the day, one combatant stood absolutely victorious, Ozurr the Bootgiver had bested all. King Wilhelm von Ostenbrücke, Queen Vienna de la Mer and Brigantia Principal Herald of the East, Master Malcolm Bowman, then did enter the list where Ozurr the Bootgiver and Fortune St. Keyne stood. Those gathered in this place watched on as with words and crowns the Kingdom of the East had new heirs, Prince Ozurr and Princess Fortune! A short while later, with many now gathered in the great hall, the King, Queen, Prince and Princess of the East did process the length of the room, and take Their rightful places. Their Majesties then invited Baron Ane du Vey and Baroness Sylvia du Vey to join Them. The Baron and Baroness brought with them gifts for Their Majesties, who in turn had gifts for the Baron and Baroness of Endewearde. The Baron and Baroness then swore their fealty before moving to stand before their seats. Their Majesty’s herald then called for the new Prince and Princess to come before The King and Queen, for there was one more thing that must be done. Their investiture as Crown Prince and Princess and Protectors of Tir Mara must take place. His Majesty spoke to them both about the importance of caring for Tir Mara and seeing to Their people there. Short cloaks were placed about their shoulders, and rings placed upon their fingers, and it was done. Ozurr and Fortune arose, Crown Prince and Princess of Tir Mara. Next to come into Their Majesties court were all Ladies of the Rose who were present, for they had tokens to offer to those they had found worthy of recognition this day. First Duchess Katherine spoke. Offering a token from Duchess Luna for a gentle who’s name this herald did not catch, and then offering tokens of her own to Baroness Sylvia du Vey and Lady Vivien de Valois. Next Duchess Avelina offered a token from Countess Mara for Sir William MacCrimmon. The next Rose to speak was Countess Marguerite, offering a token from Countess Violante to Sir Matthew D’Arden, and then a token from herself to Master Peter. The Kingdom’s new Princess, Fortune, now offered her very first token to Sir Matthew’s son, Galen. Finally Queen Vienna, offered her token to Lady Lijsbet van Catwiic. Her Majesty now called Sterling de la Rosa before Her. She spoke of how outstanding his honor had been all day. To him She gave the care of the Shield of Chivalry. Next to be summoned before Their Majesties was Matthew D’Arden. He had fought valiantly this day, falling only at the very last to Ozurr. They gave to him both the whistle and the hat of the Admiral of the Armies. Even though this hat is odd and awkward, this great fighter wore it nobly and with great grace. Now Their Majesties bade Their herald call others into Their court. First, Mabbe atte Eye. To her was given a Bell, to mark her inclusion in Their Order of the Terpsichore for her devotion to dance. Next called forward were any Newcomers present, and they were given tokens to remember this day, and encouraged to join us all again. Now the name of Cody of Endewearde rang out. A great procession appeared, and as they processed toward the King and Queen, They could be heard to wonder where within this great crush of people, Cody could be found. Once he was at last standing before Them, Their Majesties called for Their order of the Gawain and added Cody to their numbers. Cody was given a pair of green garters and a brightly colored scroll made for him by Techan MacGothraidh. Next the herald called for Lillian Crowe. Their Majesties spoke to this young lady about how much they had heard about her great caring for others, for her desire and willingness to help. The Queen, in fact, noted that Lillian had helped Her all day. Now They called for Their order of the Tyger’s Cub, and They did induct Lillian into this order. A medallion from Matthew MacGyver and a scroll made for her by Constance de St. Denis did mark her addition to this order. Now Their Majesties needed the children of this order, joined by any other children present – for it was time for the renowned toy box. But who to choose to carry it? Lillian Crowe’s voice could be heard above the din – volunteering her father, Richard Crowe, to carry it. The King and Queen thought this was a marvelous idea – and called him forward, and placed the toy box in his care. With a count of three, off he went – down the length of the hall, and out onto the great front porch, and then BACK into the hall! This is where the children caught up to him, and with peals of laughter, toys were claimed. Next to hear their name was Marjorie Kinlock, called Madge. For all of her work in kitchens and on garb it was time to make her a Lady of Their court, and to award her arms. Their Majesties saw it done, and handed to her a scroll to mark the occasion made by Agatha Wanderer, Christiana Crane, and Cedric of Thanet. The herald now called for Tiffan Fairamay, and Their Majesties spoke to her about her embroidery and fringed veils as well as her recent interest in scribal arts. They called for Their order of the Silver Brooch and with a medallion made just for her and a scroll made by Audrye Beneyt, and Alexandre St. Pierre it was done. Now Her Majesty stood. She spoke about a gentle who was always kind and courteous, one who had impressed Her greatly. She bade Tiberivs Ivlivs Rvfvs to come before Her. She drew forth a white glove and spoke of how she had added the lace at the cuff from lace left to Her by Her own grandmother, and with tears in Her eyes, She added him to Her Order of Courtesy. Then She bade him stay, for there was another She would honor similarly this day. She then called forward Edward MacGyver, and noted how impressed She had always been with his comportment. The glove The Queen now handed to Edward, had been Her grandmother’s as well, and the embroidery upon it had been finished by Her Majesty that very morning. Next to be summoned before Their Majesties was Aesa Ormstunga, called Jotunsbane. His Majesty noted how word was that her curved blade was much feared among her fellow fencers. He then had His herald call forward the order of the Golden Rapier and with Their Majesties will, words from a scroll made by Christina Crane and Nicol mac Donnachaidh and an assortment of medallions, Jotunsbane was added to their numbers. Now the herald’s voice rang out, calling for Misha of Endewearde. The Barony of Endeweard’s heavy weapons champion must be added to Their Majesties order of the Silver Tyger. With a medallion and scroll by Keziah Planchet, so it was done. The name of Matthew MacGyver was next to be called. His Majesty spoke of how well Matthew fought, his speed and stamina exceeding that of many much more experienced fighters. He then had His herald call for His order of the Tygers Combattant that this man could be added. Once surrounded, Matthew was given a medallion from the household Von Drachenklaue with a long and notable history as well as an elaborate scroll made for him by Edward MacGyver and Nicol mac Donnachaidh. The next gentle called was Anne Wyecliffe, however she could not be present, and her daughter came forward in her stead. Their Majesties wished her name added to the order of the Silver Wheel. The Queen in particular spoke at length about the many items of largess that she had found with Anne’s name upon them, about how quietly and without note, she had been serving and supporting her kingdom. Anne’s daughter expressed how sorrowful Anne was not to be able to be present this day and swore to carry the Queen’s words back to her. Next a medallion to carry to her as well, and then a scroll – a scroll created for her by the Queen’s own hand! Now David Poirier de LeLoup’s presence before his King and Queen was required. Word of his involvement in and support of the archery community had reached Their ears, as well as whispers about his service to so many. This man as well, They would add to the order of the Silver Wheel, and so this order was called forward. Two medallions, one from Anne de Basillon and one from Sólveig Bjarnardóttir and a scroll translated into French by Constanzia de Vianne and created by Lisabetta Medaglia and Kenneric Aubrey marked his addition. There were others who must be added to the order of the Silver Wheel this day. The next called for such honor was Alan of Wytleseie, another deeply involved in the archery community, and a creator of feasts as well. With a scroll made for him by Aesa feilinn Jossursdottir and Matthias Grunewald, and a medallion from Their Majesties hands, it was done. And one more as well must be added to this fine order. Broddr Tryggrsson heard his name now. For all his help organizing and encouraging fighters, leading and managing, he must be added to the order of the Silver Wheel. With a medallion and a scroll by Onora inghean Ui Ruairc, he too was made a companion. Now the young man, Walter mac Donnaghi heard his name called by the herald. The Queen had heard tell of many wonderful things about this gentle, but one story in particular stood out to her. It seems that when he was on his way back to his own camp, he came upon an older woman struggling to carry some ice to her own camp. He put his own burdens down, and immediately changed his route, that he might help this gentle. Surely this was the stuff of which Lords of Their Majesties court should be made, and so it was an Award of Arms for Walter, with a scroll made for him by Tiffan Fairamay and Nicol mac Donnachaidh. There was one who it was said, made magic with her fiber arts, and willingly shared all she knew again again by teaching classes and instructing individuals as well. Their Majesties would have this gentle before them immediately -and that is why Raven Luosey heard her name cried out. For her an Award of Arms, for a Lady she would be, with a beautiful scroll containing the ravens of her namesake, made by Yzabelle du Perche to mark the day. Next called before King Wilhelm and Queen Vienna, was one Embla Knutrdottir. The King noted that he had heard her described as a “firecracker of a fighter” and that seemed like the sort of fighter that ought to be added to the order of the Silver Tyger, and so He had this very order called forward and with a medallion that came to her through others from Kenric of blessed memory, and an elaborate scroll made by Edward MacGyve and Nicol mac Donnachaidh, she was added to their numbers. There was another, named Albrecht Ostergaard who needed to be added to the ranks of the Silver Tygers. His skill on the field of battle well known, the time had come. For him there was a scroll by Aesileif Hoarr Kona and Matthew MacGyver, and a medallion as well, as he was also added to this order. There was a founding member of the court of Royal Foresters among those assembled, and the herald now called his name. For the King and Queen wished to speak with Rys ap Dinefawr. This day had be quite wet and rainy, and yet this gentle had helped keep a fire going all day for others to enjoy. It was clear Rys must be made a Lord of Their court for this alone, if not for his growing skill with rapier, throwing weapons, heavy combat, and archery as well! And so a scroll by Marian Kirkpatrick and Aleksei Dimitrov noted his Award of Arms. There were two who should have been present this day that Their Majesties wished to honor by adding them to Their order of the Silver Wheel. However, Hrafn Iss Auga and Halldis Ulfsdottir had been unable to attend, and word had been sent that the scrolls they were to receive should be given to the Baron and Baroness of Endewearde. Thus it was so, that Their Majesties added both to the Order and had read a scroll by Tola Knityr for Hrafn and a scroll by Brangwyne of Wentworth for Halldis – which were then placed in the care of the Baron and Baroness. One more among their people, the King and Queen would have added to the Order of the Silver Wheel. They bade Their herald to call the name of Leofwyn of Wytleseie that she might stand before Them, surrounded by the members of this order. They had heard so many wonderful words about all that Leofwyn did, and so They made the orders numbers increase by one more, and gave unto her a scroll created by Elen Alswyth of Eriskay using words that had been sent by Audrye Beneyt , to commemorate the day. Now the herald was heard to cry the name of Magnus Morty. This fine fencer listened as the King spoke about all he was learning about the use of a rapier, and the community that wielded it – and as he knelt there, others could see that there was a group of people ever so slowly sneaking up behind him. And while Magnus may well have been on the East Kingdom’s champions team 6 times, he was completely un aware of the motley crew that was bare paces behind him now. The herald then called for Their Majesties order of the Golden Rapier, and the group rushed the last few paces forward – for that is whom had been tip-toeing their way to Magnus’s back. With a medallion from Nataliia Anastasiia Evgenova and a scroll made for him by Camille des Jardins, Anne Meckil von Salm, and Lucien de Wyntre the order had another among them. Their Majesties next called before them the day’s Event Steward, Audrye Beneyt. Together with her They called forward and thanked all of the staff who had made the day so wonderful. Leofwyn Whytlesie as Deputy Event Steward, Lord Cormac Longstrider & Mistress Aneleda Falconbridge as feast stewards, Master Godric of Hamtun who handled gate, Lady Lijsbet van Catwiic who ran dayboard, Lord Edmund Beneyt who handled Parking, Lady Saruca who coordinated with the Marshal in Charge for the day. Lady Olalla Tristana who coordinated the gift swap in addition to the Arts & Sciences Display. Meisterin Agatha Wanderer & Braumeister who coordinated the royal room. Lord Seamus Na Coille Aosda who created the fire, and along with the Foresters, keeping it managed throughout the day. Set up and Tear Down Crews also included Lord Thomas de Marr , Lord Nuttus Assingdone , Lord William of Wyndhaven , Lord Alan of Whytlesie , and more who Audrye was sure her tired brain could not remember. Their Majesties dismissed these folks, and then just as they began to leave, They called Audrye back with a stern look. Her Majesty spoke about the very first note offering help that She had seen after They had returned from the Crown Tournament Wilhelm had won – for it was from Audrye Beneyt. Her Majesty also spoke about how many aspects of setting up for and running Their reign, They already depended on Audrye for help with. These things and more, were the reason why, They were now going to make her a Baroness of Their court. The Queen of the East placed a white and black coronet made by Marian Kirkpatrick upon Audrye’s head, and the words from the scroll created by Tiffan Fairaway and Alexandre Saint Pierre were read – and it was so. That being all the business Their Majesties had, Their court was now closed, that all might retire to feast. During feast, the Queen oversaw one additional piece of business. Her Majesty honored the most elaborate table setting at Crown Tournament and encouraged the recipients to attend the Twelfth Night feast to award the next Portable Feast, signified by the giving of a footed bowl to those seated at that table. The names She collected were: Elspet Catto, Roland de la Mar, Elizabeth of Endewearde, Eleanor Swyft, Eva DeHaas, Lijsbet van Catwiic, Thomas de Marr, Admiranda Howard and Gruffydd Abernethy. The heralds who attended Their Majesties in Court were: Theodora Bryennissa, called Treannah, Rowen Cloteworthy, Anne de Basillon, Malcolm Bowman, Marian Kirkpatrick, Kirsa Oyutai, Aloysius Sartore, Lucien de Wyntere, Audrye Beneyt and Maria Erika Von Ossenheim. Preparations where all in place, the barony was ready and then on the morning of October 27th, A.S. LIII, known in the common era as 2018, Their Majesties, Wilhelm and Vienna arrived to join in the traditional celebrations of Concordia of the Snows, Bjorn’s Ceilidh event. In morning court the current Baron Jean-Paul Ducass and current Baroness Lylie of Penhyll received gifts from the Honorable Company of Fermenters of the Barony of Concordia who then also gifted Their Majesties with a bottle of Buckwheat mead. Then Jean-Paul Ducass and Lylie of Penhyll gave a gift to Their Majesties. A large box, that certainly appeared heavy as Jean-Paul handed it to His Majesty Wilhelm. As all assembled looked on, and wondered what could be within this plain box, Jean-Paul announced what was contained within – 100 medallions for each of the Silver level awards, made by Combat Medallions. One Hundred Silver Brooch medallions, one hundred Silver Wheel medallions, one hundred Silver Tyger medallions and one hundred Silver Rapier medallions – quite a spectacular gift indeed! As Their Majesties sought the right words to thank them for such a gift, the time to call both Jean-Paul Ducass and Lylie of Penhyll before Them arrived. The Royal words of thanks for this gift, rolled into words of thanks for all these two gentles had done for the Barony of Concordia, and indeed, for the Kingdom. Two beautiful scrolls by Onora ingheann Ui Rauire were read, further extolling the worth of these two extraordinary individuals. Jean-Paul expressed a fear that there was perhaps someone assassinating Barons and Baronesses, and that they could not possibly continue on with that hanging over their heads. And so it was decided, that Jean-Paul and Lylie would find peaceful relaxation at Their Majesties “farm” for retired Barons and Baronesses, in Their “Retired Baronage Program”, and off they went. Thus it was necessary that the coronets of Concordia pass to new hands. All the former Barons and Baronesses of Concordia where called forward – and the coronets were passed from hand to hand, until they returned to the King and Queen – and once the Herald had called forward Faolan an Sccreccain and Maria Erika von Ossenheim, the coronets were placed upon their heads, Investing them with the burdens and joys of seeing to the people and lands of Concordia of the Snows. Though there was one last piece of business for attending to this morning. Their Majesties called for Caine Ramsey to kneel before them. There was to be a Quest for this man. The Queen seemed quite certain he had earned one, though truth be told, I don’t recall his offenses being enumerated (perhaps they are too heinous to share in gentle company?). No, not one Quest – but 14 Quests for this man, The Queen declared. Caine may have blanched a bit at this news, though it was clear he intended to remain steady. Her Majesty did then soften a bit, and noted that through proper behavior and excellent execution of the earlier Quests, he might be able to reduce the number a bit. Today She would assign the first of his many Quests. He was to manage and oversee Her own Queen’s Guard this day. With that it was time to suspend Their Majesties court so that the days’ festivities in honor of the new Baron and Baroness could commence. Later in the afternoon, as Their Majesties entered the hall for Their afternoon court, one of the East Kingdom’s most treasured bards, Drak Oranwood, performed music he had prepared for Queen Vienna. He had heard that The King greatly treasured the works of the bard called ABBA, and he had arranged some traditional music by this bard, with words he had written specifically for our most noble Eastern Queen. As the chorus of “Vivat The Eastern Queen” (see ABBA’s original work called “Dancing Queen” for the proper melody) rang through the hall, and The Queen’s own guard danced behind her – Their Majesties entered the hall once again. Faolan an Sccreccain and Maria Erika von Ossenheim first gifted Their Majesties with a basket of delicacies including coffee and lemon cello, and Their Majesties gifted the new Baron and Baroness with a spa basket and 2 new feast sets to give to newcomers, as was the tradition They had begun. Their Majesties then suspended Their court so that Faolan and Maria might hold their first court. As they proceeded through the business they had planned, they eventually called the former Baron and Baroness to stand with them at the dais, and together called Rhys Aiden Bifjord into their court to honor him. As they finished, The King leapt to His feet, He had heard the words about this gentle, about decades of service, and was insistent that there must be further honors. His Majesty’s herald reopened His court – and with His Queen at His side, they made Rhys Aiden Bifjord a Baron of Their Court, and placed a coronet upon his head, and promised him a glorious scroll to commemorate the day. The Herald then suspended Their Majesties court once again, so that Baronial court of Concordia might continue. Once all the Baronial business was concluded, the court of Their Majesties East was opened once again. First called before them, former Baron of Concordia, Master George Emerson True, for he wished to swear his fealty to Them. His fealty was followed by the fealty of Christoffel d’Allaines-sur-Comte, Seneschal of Dragonship Haven. Once concluded, Their Majesties took this moment to announce that Dragonship Haven would next have a pair of Baronesses to lead them – as Mistress Renne Wyrm and Lady Rhode Kephalania were to soon hold this Barony for Their Majesties. Their Majesties next invited all the newcomers among those assembled to come forward and accept a token, along with Their hopes that they would attend another event soon. The herald then called for Matija Potocnik. They spoke words about Matija’s skill with the rapier, and then had Their herald call forward the order of the Silver Rapier, for it was most definitely time to add Matija to their numbers. With a medallion and a scroll by Faolan an Sccreccain and Grimm the Skald, it was done. His Majesty next spoke of the kingdom’s need for individuals who were fleet of foot, and before all the members of the order of the Silver Rapier could leave the hall, He called forward one known as Bobby Tights, though his right and proper name is Robert Tytes. As Bobby came before the King, a great chest of toys was brought forth, and then Their Majesty’s herald did call for all the children present – there was a great amount of joy and laughter as all realized that Bobby’s fleet feet would quite soon be tested! And run he did – out of the room and down the hall – with children of all sizes following quickly on his heels. Next to be called before Their Majesties was Amia Turner and the order of the Silver Brooch as well, because of her research into historic cooking, the scrolls she makes for her barony, as well as her involvement in Athena’s thimble, The Queen was adamant Amia be added to this order. With a medallion passed on to her and a scroll by Marieta Charay, she was welcomed among their numbers. But there was another who must be added. The name of Concordia’s new Baroness was cried next, and as Maria Erika von Ossenheim came forward, there was a look of disbelief upon her face. The Queen was quick to point out the beautiful garb Maria so often makes, including that which she was wearing this very day, and how well deserving she was of being made part of the order of the Silver Brooch. With a medallion and a scroll made for her by Malys MacGregor and Derek Fairhair, it was so. Now the King called out for Anne de Basillon himself, not leaving this task to His herald. She came forward, I think perhaps fearful that she was to face the same fate as her beloved Caine had in morning court. The King however, began by listing all the many things she was doing – Chief of Staff for Concordia’s new Baron and Baroness, Event staff many times over, fencing marshal, Royal staff, Baronial officer, and now most recently a voice herald as well. His Majesty acknowledged that it was not likely He could make her stop doing things (something about her resisting), and so instead He would reward her, by adding her to the ranks of His order of the Silver Crescent. She was given the Blood Guard lineage medallion, and a lovely scroll made for her by Svea the Shortsighted, and thus it was done. But before this order could retire to the back of the hall to welcome her, there was another name that greatly needed to be added to their roll. Muirenn ingen Dunadaig heard her name cried out, and as she came forward there was great praise for all the many things that she has done as a herald for the people, the barony and indeed the Kingdom of the East, for she is the Blue Tyger Herald, the herald in charge of submissions for all of the East Kingdom. The very herald reading her scroll, one Yehuda ben Moshe, took his own medallion off from around his neck, and passed it to Their Majesties to place around hers. And then he read the words written for her by Alys Mackyntoich from the scroll created for her by Chrestienne la pescheresse (called Bruni). But one final piece of business to attend to before all assembled could go enjoy a great feast. Concordia’s newly minted Baron now heard his name, Faolan an Sccreccain, cried out by Their Majesties herald. The Queen spoke of the beautiful and plentiful scrolls that came from this man. Then the King stepped forward, and told of a realization He had recently had while viewing some example of beautiful scrolls in the company of Royals from other lands. Those other places are not as blessed as we are in the East, with scribes of such stunning skills. The art that Faolan and others produce sets the Eastern Kingdom apart from other places, and that is something we should be aware of, and which should be rewarded. And so, Their Majesties order of the Maunche was called forward, and Faolan an Sccreccian was added to their numbers, with a medallion from Fiona O’Maille ó Chuan Coille, and a scroll written by Aislinn Chiabach, and created by AEsa Sturladottir. Their Majesties offered heartfelt thanks to all who had worked so very hard to make this beautiful day possible, and with that, closed Their court. And it was foretold that the King of the East and his Majestic Queen, Wilhelm von Ostenbrucke and Vienna De La Mer would visit the shores of Their fair Barony of Ruantallan. And they came and held a Great Court, to honor citizens as They saw fit on the lovely October 6th day. The first item in the Royal Court was to invite in the Baron and Baroness of Ruantallan, Guthfrith Yrlingson and Isobel de Mowbray, who did swear fealty to the King and Queen of the East, then sat and opened their own court at the whim of the King and Queen. And at the end of Their Court, they did honor newcomers to Their Court with a small token, to which the King and Queen also added their personal tokens to the populace. And the Baron and Baroness then did close their court and Their Royal Majesties did open the Great Court. It has come to light that the list of Queen’s Guards present at Coronation that Their Majesty’s Herald had was incomplete. There were five Guards present, who’s names did not appear on this copy of the list, and who therefore did not get called into court to receive their baldrics. For this unintended slight, Their Majesties and I are terribly sorry. It is our hope that Sheikh Jibril ibn Ammar al-Fayyad, Ulvr, Lady Leurona Winterborne, Lord Suuder Saran and Lord Kristoff will forgive us for this error, and present themselves in Their Majesty’s Court at the next event they attend so that We can honor their service properly and present them with their baldric as is right and proper. held on September 29, A.S. LIII, 2018 C.E.